the 2002 academy awards is next weekend, and here's my stab at who i think will win the oscar. this is the category i'm least confident in predicting because there doesn't seem to be a clear cut winner. i'm giving it to jennifer connelly though. i don't know, i just have a feeling about her. a close second would be marisa tomei, but only because i have a secret crush on her. this is the year of the australians! nicole kidman is going to win this one! there's been talk about halle berry maybe taking away the oscar for monster ball, but can halle sing like nicole? who is the more talented actress here? besides, 2001 was a really bad year for nicole, with that weird scientologist guy she was married to filing for divorce. nicole totally deserves the oscar. lord of the rings! in the bedroom, too depressing (although i didn't see it, but that's what everyone who's seen it tells me), gosford park, standard issue altman stroke film, a beautiful mind, all the recent controversy over inaccuraries between the movie and what happened in real life will damage its creditability, which therefore will hurt its chances of getting the oscar. that leaves moulin rouge and lotr. moulin rouge i really loved, but it might be too ahead of its time for academy voters. that leaves only lotr. doesn't the academy love movies that are epic in scope? and lotr has something for everyone, humor, horror, action, love, special effects, friendship, heroism... it's been a while since we've seen a movie like this. lord of the rings, there is no comparison, it is the only choice. a close second is moulin rouge, the dark horse. if that movie wins, it will be the ultimate vindication for baz luhrmann. but lord of the rings, don't be surprised to see it win. ian mckellen as gandolf, all the way. i think it's funny that ethan hawke got an nomination. he was good in gattaca, but i've never taken him seriously. there are some other tough competition like jon vought and ben kingsley, but i'm going with mckellen. besides, he has a wicked sense of humor, based on his performance on tonight's saturday night live. russell crowe will win. tom wilkinson? who? sean penn should be ashamed of himself playing a mentally handicapped person, that's a desperate cry for an oscar which he's not going to get. denzel? i didn't see training day, but it'd be cool if he won, but he doesn't have the industry clout of russell crowe. will smith? do you think academy voters would give the cherished oscar statue to the fresh prince? besides, russell crowe is australian, which gives him an unfair advantage this year, being that it is the year of australians. if nicole got an nomination, why isn't ewan mcgregor on this list as well? robbed. can anyone argue with my prediction that peter jackson will win this? sure, he doesn't have industry friends like ridley scott, david lynch, robert altman, or ron howard. he's sort of the maverick of the 5 directors nominated. but based on the sheer logistics of what he's done and what he's still doing, nobody could've predicted that he could accomplish what he's done so far, you have to tip your hat to him. i think ridley scott is deserving as well for managing the shoot for black hawk down, but that movie didn't move me as much as lotr, and you can even argue that bhd is some sort of jingoism riding on the coat tail of the current wave of patriotism sweeping the nation. i also really liked mulholland drive, and i think this might be david lynch's best movie, but i'm still going to go with peter jackson. btw, baz luhrmann was robbed! my father and i went to a motorcycle expo in saugus today. nothing big, just a showroom where a few local dealerships where displaying the latest models, from cruisers to motorcross to streetbikes, as well as atvs and a few water vehicles. we climbed on a bunch of bikes and got a feel for the seat height, steering, and weight of the vehicles. 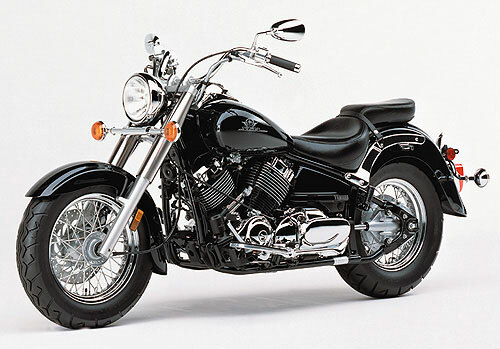 if we were to get a new motorcycle, i think it'd be the yamaha vstar 650 classic, $6000 with a dry weight of 500 lbs. (the honda rebel we have now weighs 300 lbs.). today would've been a great day to buy, all bikes were specially discounted for the expo, with savings between a few hundred to a thousand dollar over what it'd cost normally. unfortunately, we were just there to browse and had no real desire to buy just yet. it was kind of weird walking around the showroom floor, seeing all the different people who're into motorcycles. for the most part it was guys, but there were also some women there, and not just girlfriends of biker guys. probably 20-30% of the people there were women. that's kind of funny, i just remembered when i use to work at screen house and started riding my bike, all the coworkers i knew who rode motorcycles were women. surprisingly, a lot of little kids were there at the expo as well, climbing onto motorcycles they couldn't even reach the gear shift for. today was all about vehicles. earlier, i read a news story on boston.com about how the mini is making a comeback to the american auto market after a 35 year hiatus. it's now produced by bmw, and when i saw the photo, i fell in love. i always thought i was the kind of guy who didn't really care what kind of car i drove just as long as it got me to where i wanted to go, but i'm slowly changing my mind. a car can very easily be an extension of yourself, an expression of how you want people to see you, a really expensive accessory item! ($20k) the only thing i'd worry about a mini is because it's so small, if it ever got involved in some sort of collision accident, that car could very well be a deathtrap. i'll have to check the safety reports when the car becomes available.